Is There a Reason to be Scared If you Notice Atypical Mole? Have you noticed an unusual mole and suspect melanoma? Maybe it is just an atypical mole! Did you happen to notice an unusual mole or freckles on your body, became paranoid and spend a couple of hours on the Internet searching in fear, recognizing the symptoms of melanoma? That is actually a normal reaction. In some point, for even a little as a mole, we can become paranoid and convince ourselves that there are symptoms when there are not any. Actually, it is a good thing that you check your body regularly, for any abnormalities, but instead of searching for symptoms on the Internet, try and contact your doctor to get a professional opinion on the matter. An atypical mole can easily be mistaken for melanoma. Find out why! “Atypical mole” and “Dysplastic nevus” are terms that refer to an unusual mole which is commonly mistaken for melanoma. That is because of the great resemblance that atypical moles and melano-ma have. An atypical mole, or Dysplastic nevus, is an unusual benign mole which it is a bit different from the other moles that we all normally have on our body. Dysplastic moles differ from common moles by their size, color, surface and border. Dysplastic means atypical, and nevus means a mole, while nevi are the plural of nevus and it refers to moles. What are the Characteristics of Dysplastic Nevus? Size – Atypical moles usually have a bigger size than a normal mole. Atypical moles are usually more than 5 millimeters wide. Color – Atypical moles present a mixture of colors – from pink to brown. Surface – They usually have a smooth surface, slightly scaly, or in some cases, the surface can be pebbly. Borders – Unlike normal moles, who have clearly determined borders, Dysplastic nevus has irregular edges that may fade into the skin. Where does usually a Dysplastic Nevus Appear? Dysplastic nevi can be found anywhere on the body, but there are areas where these moles can be commonly found. These areas are usually exposed to the sun, e.g. the back. But Dysplastic nevi can be found on areas, such as breasts and scalp, which are not usually exposed to the sun. When do Dysplastic Nevi usually Appear? Dysplastic nevi usually occur during the period of puberty. However, it is not uncommon for atypi-cal moles to appear in adults. Can a Dysplastic Nevus Turn into Melanoma? Although Dysplastic nevi can easily be mistaken for melanoma, you need to understand that Dys-plastic nevi are benign moles, as for melanomas, they are maligned. Although there is a possibility for atypical moles to turn into melanomas, it is considered that most of them stay in the form in which they were when they first appeared. However, studies show that people with more than 10 atypical moles have a greater risk of developing melanoma, than people who only have a few atypi-cal moles, or do not have any. When do you Need to Schedule an Appointment with Your Dermatologist? Probably there is not a reason to be worried when you notice a Dysplastic nevus on your body. But, you should definitely visit your dermatologist if you notice any changes in the atypical mole. 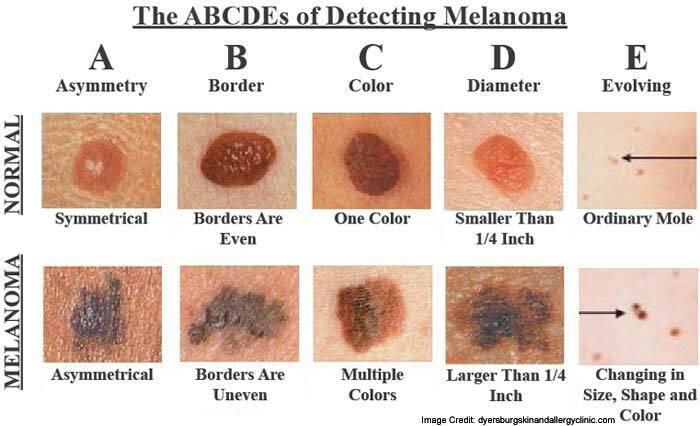 If you have a family history of melanoma or you have a large number of moles present on your body, it is always a good idea to protect yourself from the sun, using a sun cream with high protective factor before you expose yourself to the sun, and learn the ABCDE’s of melanoma. Will the Doctor Remove your Atypical Mole? The doctors do not usually remove the atypical moles. That is because of two reasons- there are very few cases where it has been reported a change of an atypical mole into melanoma, and there is no way of preventing melanoma by removing any or all of your atypical moles. If you do notice an atypical mole on your body, in most cases there is no reason to worry. Our body is changing with time, and that is totally normal. However, if you have a family history of melanoma, or you have a large number of moles present on your body, maybe it will be a good idea to schedule an appointment with your doctor. Try and relax, and forget about all of those people of the Internet sharing stories about how an atypical mole is a melanoma, they will not do you any good.